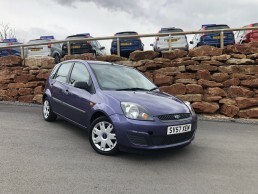 A well maintained Ford Fiesta Zetec Climate with a great service record including a documented cambelt change and several itemised full services in the history. Clean, tidy and a great runner, this 3-door Fiesta has a high specification for its price and is finished in Colorado Red. Features include full exterior colour coding, 5-spoke alloy wheels, chrome front grille, front fog lights, auto headlights, electric folding mirrors, air conditioning, QuickClear heated front screen, Mp3 CD player with aux. input leather steering wheel, remote audio control, trip computer and much more. Drives superbly and is HPI checked and clear. Sold with a new MOT plus a nationwide parts and labour warranty. Ready to book a test drive? Call 0117 290 1234 or use our online booking form. You can also visit us during our opening hours at our used car dealership in Winford, BS40 8HB. A fantastic car with a great value price tag. This small used car features a host of comfort-enhancing features and is highly economical to run. Sold with a brand new MOT and nationwide warranty. Book your test drive online, send us any questions you might have using the tab above or visit our used used car dealership Monday to Saturday to see this excellent Fiesta for yourself.